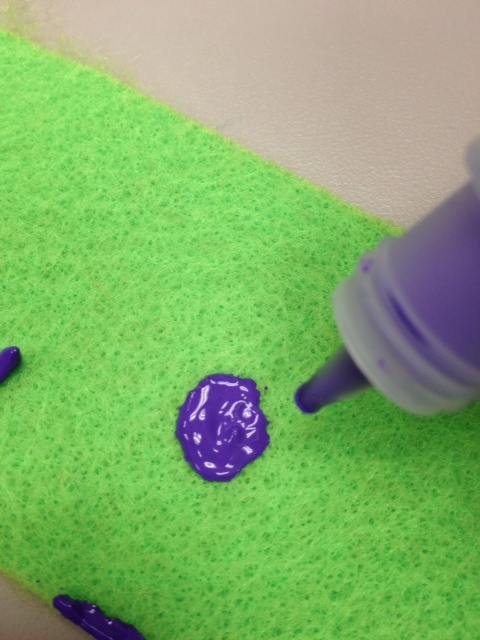 Today, instead of posting a new flannelboard idea, I’m going to share with you some of the tips and tricks I’ve learned for using puffy fabric paint on felt. Some have suggested I am a “master” at this, although honestly, I don’t see it. Probably because you all don’t get to see all the pieces I have messed up dreadfully and end up re-doing or scrapping completely. Or all the paint that ends up on my fingers. But thanks for the vote of confidence, and prepare to be underwhelmed [insert smiley emoticon here]. This is my paint of choice. No particular reason, it’s just the first kind I bought at Michaels and the only kind I’ve used subsequently. I’ve not compared it to any other kind. It can be purchased as individual colors or in packs of multiples – “Shiny,” “Iridescent“, “Neon” or even sparkley colors! I also just noticed these pen-like versions, which might be even easier to use. Joann’s also has it, and you can mail-order it via Create For Less and Amazon. Tulip brand paint is also commonly used, I think. I don’t know it very well, but you may wish to try it out instead. Maybe I’ll get some too and let you know how it goes. The best felt to use, in my opinion, is wool or part-wool. 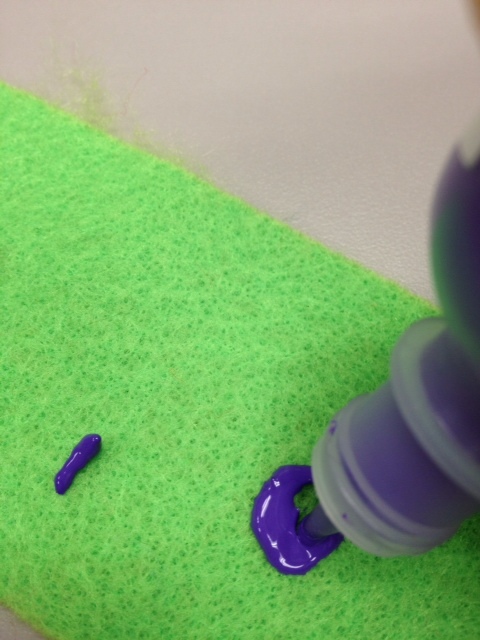 The other, flimsier, craft felt you get in the store tends to be “fuzzier”, and those little bits of thread get caught in the paint tip and you end up spreading paint and fuzz all over your piece. I think outlining/accenting a piece with a brighter version of the same color gives it some pop and makes it easier for the kids to identify. I outline the outside edges of a shape, and draw over any pen lines. Anywhere I would have used a pen in the past! 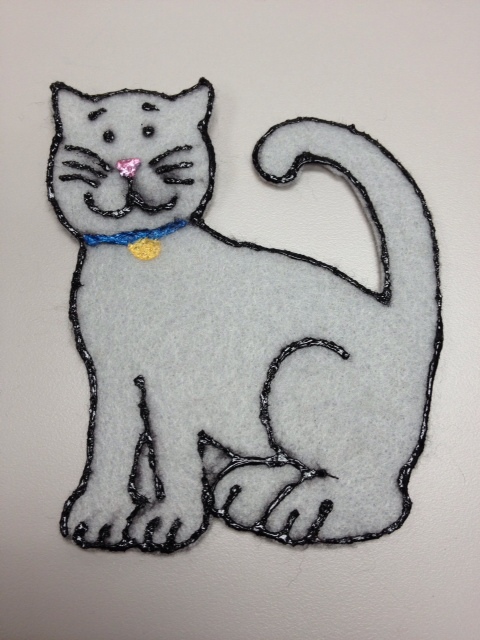 Like the cat’s collar above, and Sunny’s smile, I use the fabric paint to add decorative details just for fun. The sun doesn’t NEED a smile to be identified as a sun, and the cat doesn’t NEED a collar. But they look extra special with these details! I have mentioned in the past how I like to add words to my flannelboards (where feasible and appropriate) to add to the young listeners’ print awareness. 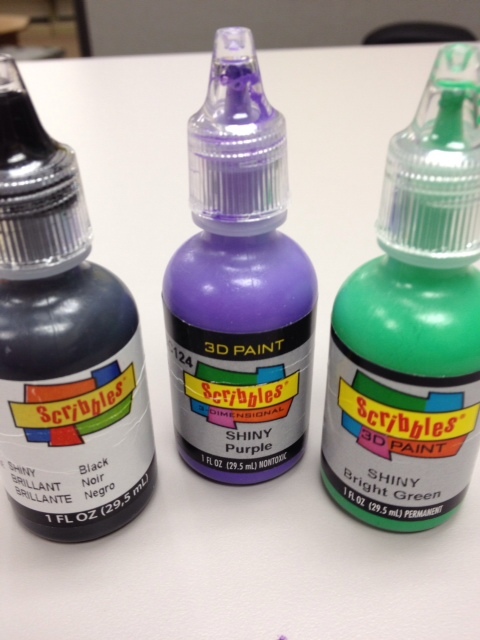 It’s easy to do with fabric paint because I hold the bottle like a pen and just write (slowly, but I write). This part’s tricky. 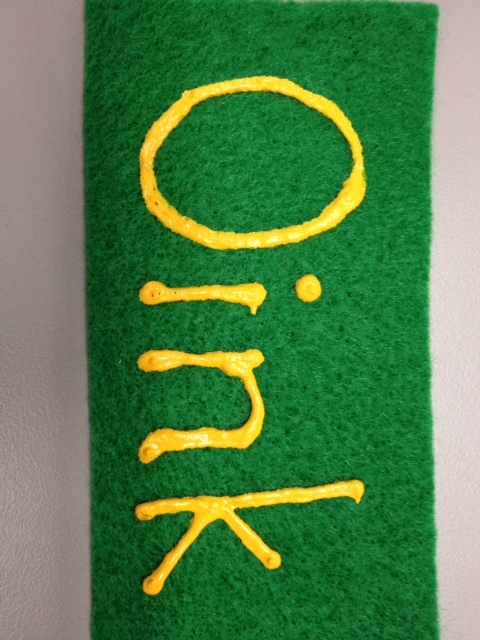 How do I describe how I put the paint on the felt? 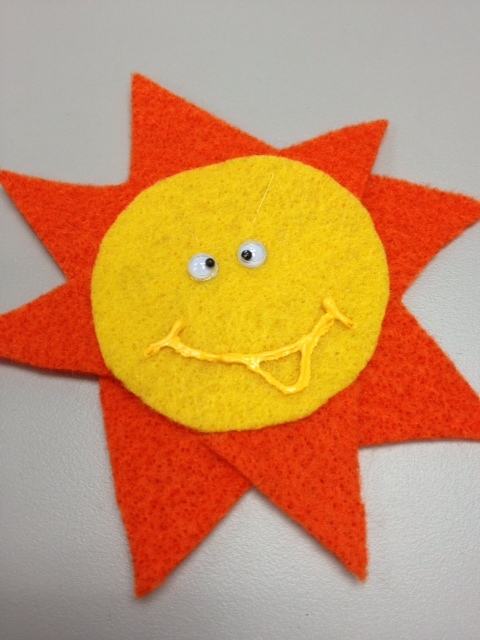 I can’t, really, the best thing for you to do is get a piece or two of scrap felt and, by trial-and-error, see what works. But I can give you few tips. Put some paper under your felt before you paint (or you’ll end up, like me, with a desk decorated in various swipes of color). Squeeze a little paint out on to the paper before you start, to judge how fast the paint is running. That way you won’t end up with a big glob on the beautiful felt elephant you’ve just cut out, or realize you should have shaken the paint up a bit to avoid a watery mess. Some bottles have bigger openings than others, so it’s good to know in advance how thick the paint will be. Lines: squeeze gently and move slowly. Try to move from left to right (if you’re right-handed) so you don’t do as I did and end up with smashed paint all over your hand. 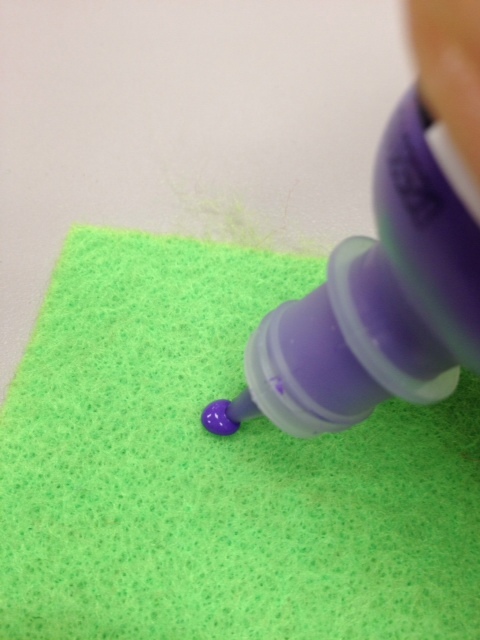 If you accidentally end up with a big blob in one spot, stop squeezing and use the tip of the bottle to “paint” the blob (in effect spread it out) along the line. It will look like less of a blob. Next, squeeze a little paint inside the shape. 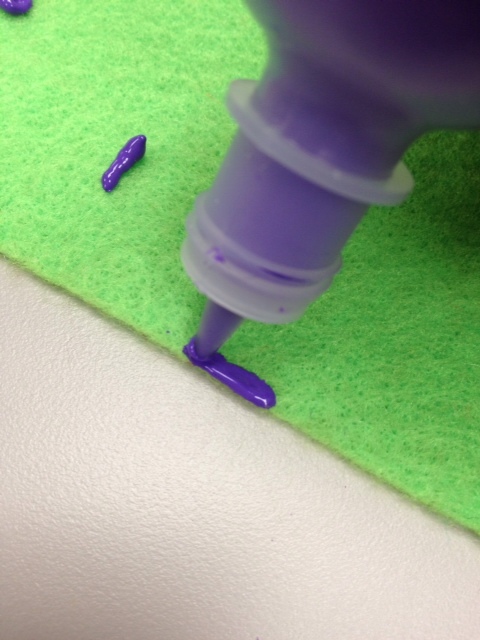 Then use the tip of the bottle to spread it around inside the shape (this way, you’re not wasting paint. You don’t REALLY need to squeeze paint into the whole shape, it’ll end up bulky and globby). Squeeze/spread more paint as needed. So, there you go. 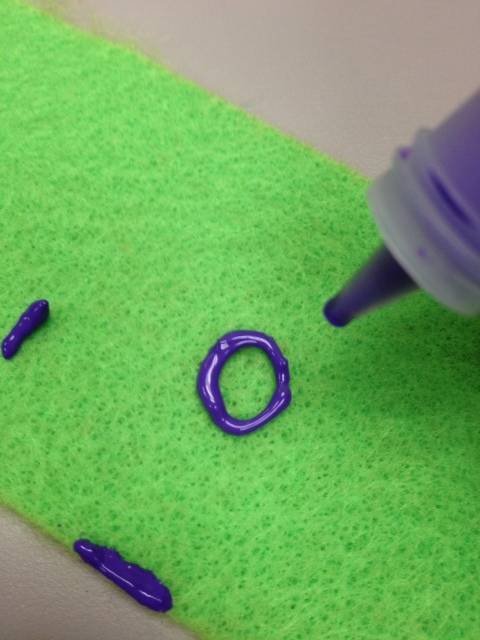 The tricks of my puffy-paint-mastery trade. Probably a lot of this is common sense for my fellow crafty librarians and teachers, but I hope that it was helpful to some. Now, *claps you on the back* go forth and make the best darn puffy-painted flannel pieces you can! I believe in you! Some books really lend themselves to discussion. They make storytimes REALLY conversational and fun. 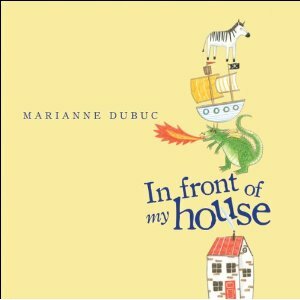 Marianne Dubuc’s In Front of My House might not make the best storytime story (the book is kinda small so wouldn’t work for big crowds) but reading it one-on-one could prompt some fun storytelling, or, if you’ve got a class of kindergarteners or 1st graders, lead to a great writing exercise. Hmmm…I’ll have to think about the rest of it. *One picture is of a hunter with a gun. He’s not doing anything with it, or aiming it, just holding it. It’s not mentioned in the story. But some schools have rules about guns, so I thought I would give a heads’ up. Ehlert, Lois. Un lazo a la luna=Moon Rope. A Peruvian folktale about a Fox and Mole who try to climb to the moon via a grass rope. Flannelboard: Un elefante se balanceaba — I have a bunch of tiny elephants and I “balance” them one by one on a piece of yarn stretched across the flannelboard. The kids help call the elephants and count each time. When we get up to about 7, I shake the flannelboard and they all fall off. Fue a llamar a otro elefante!/He called another elephant to come! (Shout as if calling): ¡Elefante! Song: Bate Bate Chocolate (the version here isn’t sung, but it gives you the idea) Great participation song. We count and pretend to mix the chocolate. Diaz, David. De Colores=Bright With Colors. I’ll sing this book; it’s a lovely song. David Diaz’s illustrations are gorgeous. I may add one more book; I’m not sure yet. But this is the general plan.